﻿ Awards – Ross-Campbell, Inc.
Ross-Campbell approaches each and every project with a commitment to cutting-edge creative development as well as thorough implementation and follow-through. Ross-Campbell has successfully executed numerous regional and statewide public awareness efforts with budgets ranging from $100,000 to over $1 million. The firm has also produced hundreds of hours of captivating television programming. 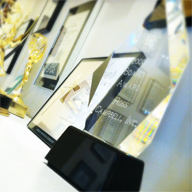 Without exception, these efforts have resulted in program successes for the firm’s clients, and professional recognition — in the form of dozens of creative awards — for Ross-Campbell. Addy Awards Competition – Silver Award – Bilge Pad Exchange P.O.S.